It's been a few weeks since I've posted for Sepia Saturday. I am picking up where I left off, with another photo of my Gram, Helen Zempol, who I showcased here and here in her old class photos. 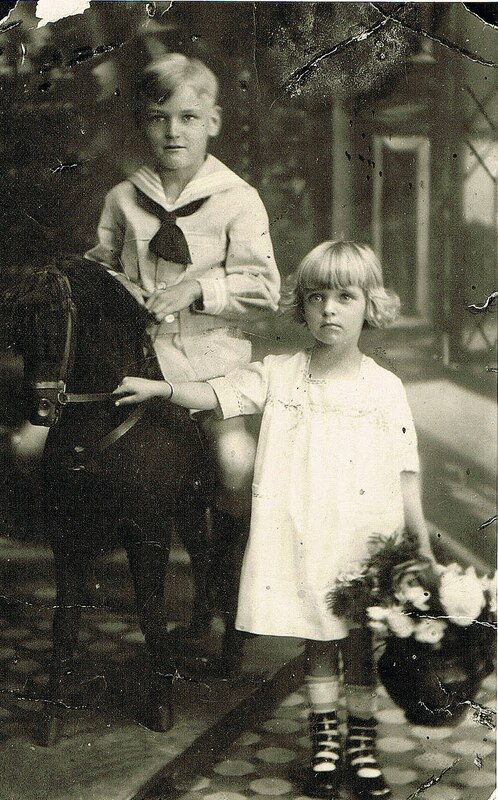 I don't know where this photo was taken (probably somewhere in NJ) or why Gram's brother Steve is sitting on that horsey thing wearing a sailor suit. All I know is that I love Gram's shoes. I think they'd fit in nicely with some of today's funky styles. She was ahead of her time circa 1918. See what I mean? Check out these shoes straight off today's runway! Check out more fashions from times gone by at Sepia Saturday. Isn't it funny how styles seem to circle around and round..coming back into vogue years later? Her shoes and her hair - amazing! Wow, your Gran was trendy! Love these. I am older than dirt and I remember have shoes that we had to lace with a hook. They were high top too. LOL Thanks for stopping by. Well spotted and matched with those shoes. And if you are able to find the equivalent of those shoes in this present day and age, where can I get a sailor suit from? What a beautiful photo, it will have been taken in a photographers studio and he would have posed them. Love your grandmother's shoes and you are so right that they would fit in with today's fashions. What beautiful children these two are. A great post. Those shoes are pretty amazing. Steve looks a little large for the horse really. I think the photographer should have put you Gram on it. I just love your old photos! you put LADY GAGA to shame, but iwince at the pain she must have felt back then. but the pic has such an eerie feeling. i LUV it!!! Great picture, but the little girl looks so sad. Those are amazing shoes! It's a beautiful photo in general with the pretty pony. Plus, you have good-looking relatives. Someday I'll post some of my seriously homely and scary looking forefathers. She was certainly a stylish little lady. Brother and sister both very beautiful children. Yes,Some Serious Shoes! I Love The Way She Holds Onto The Rocking Horse.Ready To Join The Journey!